We've all been 'had'. But we may not realise how often. The best persuaders know how to change your mind without you ever finding out. 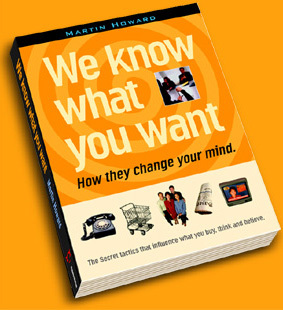 We know what you want: How they change your mind. 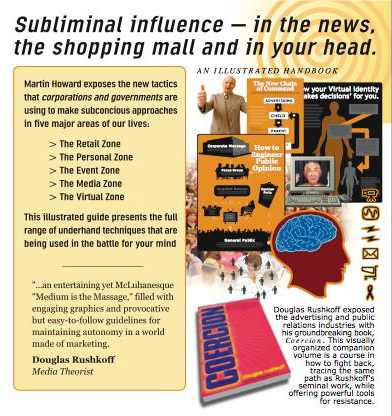 is a handbook for locating the hidden messages that bombard us every day. Now you can find out the new techniques that corporations are using to make subconscious approaches without consent. It exposes five major zones where consumers are being confronted: In the retail context, at public events, through information media, personal friendships, and the personal computer. Sensory Manipulation at the Supermarket? Data Mines: Predicting your next purchase. Would you fall for a crazy cult? "...filled with engaging graphics and provocative but easy-to-follow guidelines for maintaining autonomy in a world made of marketing."